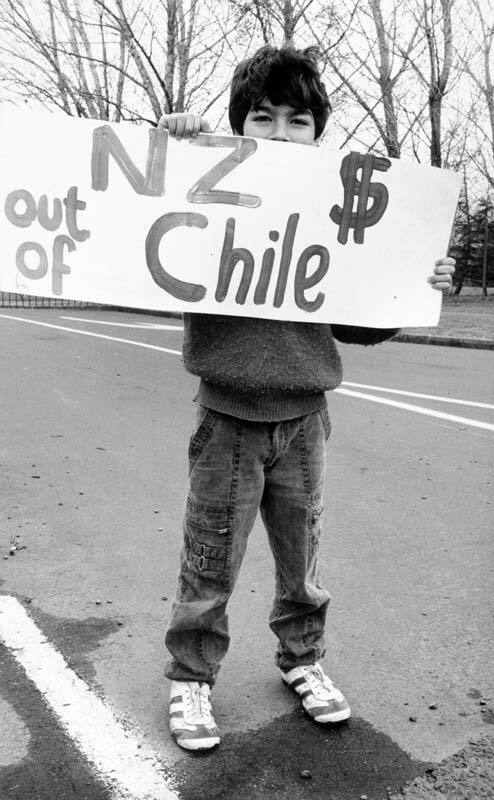 Ricardo Espinoza, aged 8, protests outside the Manukau head office of Carter Holt in September 1988 on the 15th anniversary of General Pinochet's 1973 coup. Pinochet used terror and violence to crush dissent in Chile, leading many Chileans to seek refuge overseas. Espinoza's family arrived in New Zealand in 1981. He and others saw Carter Holt's investments in Chile as supporting the dictator's regime and wanted the company to withdraw from the country.